The 80-20 rule is a powerful and nearly universal, which states that, for a large variety of events, 80% of the results will come from 20% of causes/inputs. It is also known as the Pareto-principle, after economist Vilfredo Pareto, who observed that 80% of the peas in his garden came from 20% of the pea pods. The 80-20 rule has a wide range of applications. In business we can observe 80% of sales come from 20% of products (yes, nearly 80% of our rod sales come from the 12ft Iwana, one of five models we offered until a few days ago). In software, 80% of problems come from 20% of bugs, and so on. Now, what about fly-fishing? More specifically can tenkara show us that 80% of our results will come from 20% of our effort, 20% of the spots we fish, 20% our equipment, or 20% of our flies? What are your thoughts? Can 20% of the spots you hit produce 80% of the fish you catch in a day? Sometimes it sure seems like it, like this weekend when I fished 20 or so pockets, catching most of my fish in 4 or 5 of those productive spots. But, in other streams it seems like every pocket holds a fish, so who knows whether this one applies or not. But, I’m fairly certain if you were to weight them, 80% of the weight of all your fish would be a result of 20% of them. If 20% of the equipment you carry is necessary for 80% of the results while fishing, is it worth carrying or buying that extra 80% of equipment (think reel, multiple lines or leaders, strike indicators, split shot, etc), for a possible 20% of cases? I personally am content with 80% of results if I’m able to leave that 80% extra burden behind. Do 20% of your flies catch 80% of your fish? I carry 4 tenkara fly variations with me, but on any given day I keep one fly on for the biggest portion of the day, so I’m pretty sure I catch at least 80% of my fish on 1/4 of my flies (sure, 25% of them). Now, I know for a fact that if I only used 1 fly pattern, as Mr. Amano does, I would actually catch 100% of my fish on 1 fly and probably beat the Pareto-rule. I wish I had the discipline to keep a journal and see if the 80-20 rule can be put to the test, but I don’t. However, I have a hunch the observations above are true. I would love to hear your experiences now that you have the 80-20 rule in mind. 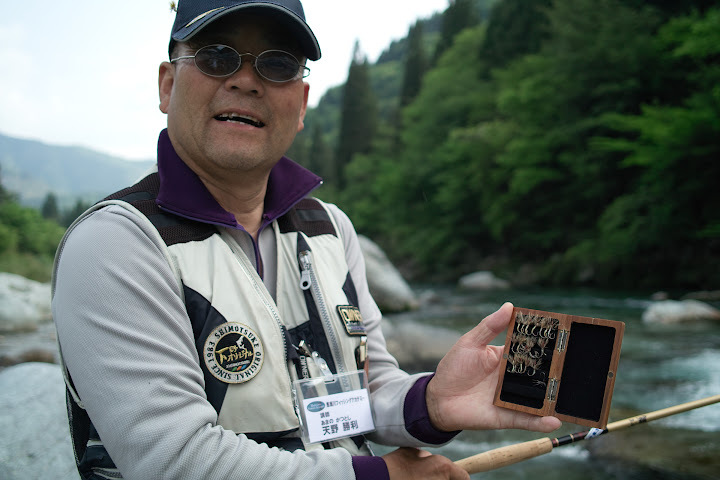 » Tenkara, Tenkara Philosophy » The 80/20 rule in fly-fishing? 8 Responses to The 80/20 rule in fly-fishing? Im 63 right now. When i was 19 i served a 2 yr mission, then i got into sales and have had success in that field for 44 years and guess what? I learned and applied the 80/20, 1/3rd rule EARLY and used it to set REALISTIC goals in ALL areas of my life! It insures the amount of real effort compared to Self-help gurus teachings. You CANNOT beat these principles! You either play by the “cold-hard facts” or suffer defeat, depression and finally give up!!! Accept it and MAKE it work in your favor, stack the chips in YOUR favor!!!!!!! Interesting blog on this 80/20. I never heard of it before. I whole heartedly believe this. I (sometimes consciously) try to find the types of places in a river that the most fish (80% of fish) are actively feeding and target those types of areas. If I find fish are regularly feeding in the shallow tailings, that is my target for the day. Sometimes the head of pool/pockets, sometimes the deep pools, sometimes the tailings or end of pockets. I have also condensed my fly selection down to three. I try to find which one is getting the 80% of attention, and use that one for the rest of the day. Professionally, I find that 20% of my colleagues are the most productive ones. In turn I try to spend 80% of my time helping, learning from, and teaming up with that 20% and find that I am consistently one of the 20% myself. As far as flies and water, my experience has been just what you have observed. I do keep a journal, and it bears this out. I still have (too) many types of flies in my tenkara box, but most are those that I say to myself, “I need to try this sometime”, but I don’t because of my main 4 patterns. I think you forgot one…..20% of fishermen catch 80% of the fish! That one’s true for sure. Actually I think it might be closer to 90/10. I agree with you completely and have seen this rule apply in all aspects of life, especially fishing.